Para quem não consegue passar da barreira, vai ver como é easy! The end puzzle is easily jumped over. Avoid hitting the circles or you get ported back to the beginning. The end turn-in ? is incorrect if you hearth back to your garrison. The correct place to turn it in is outside your town hall at Bodrick. bring your warlock buddy along with you and avoid the jumping all together. demonic gateway right through the runes. For horde you turn this in at Rokhan the troll envoy outside on the stone ledge of the town hall. If you are a hunter, jump the first barrier (don't land on a glowing circle) turn your back to the Grimoire and hit "disengage". You'll easily clear the barriers. The way I handled this as a rogue was to get as far as I could by the right side (between the first and second purple circle) and then sprint to the end. There seems to be a slight delay between the moment you step on a circle and when you get ported out. Sprinting through the remaining circles did not trigger the port. There also was a mage with me who also got to the same point and then blinked to the grimoire. Hopefully this will help someone getting through this puzzle. A great ending to the quest chain. 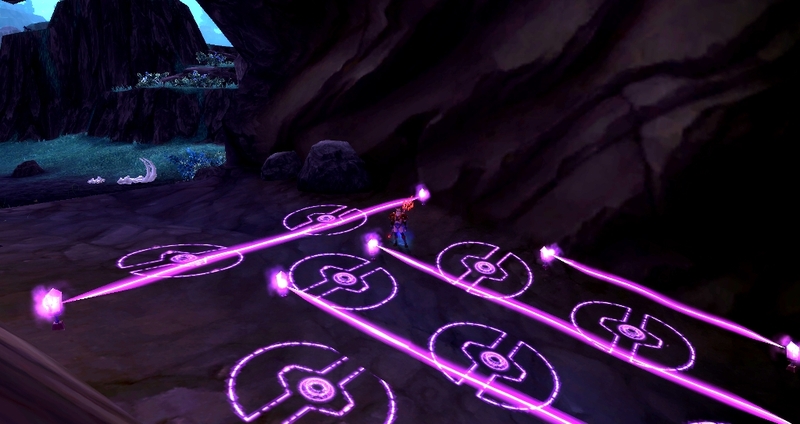 Just have to avoid the purple lines and markings on the ground, or else you'll get teleported out of the cave. Have fun! As a priest, just Levitate over the pink lines and avoid the circles. Confirmed that hunter disengage works great for this. Just stand on the rock and you get right in. For anyone who doesn't know where the cave is, it's Swamplight Cave at 42; 73 near the shore. As a warrior, you can just Heroic Leap over all the purple stuff and pick up the quest item. On both my hunter and my shammy I discovered that jumping on to the right wall, then turning my back to the grimoire and moving backwards got me into the cave. There's an easy way to do this without any skills or items. Just know every circle teleports you out of the cave and touching the lines will push you back. You have to time your jumps to land in an empty area. The lines are low enough where you can jump over it, just land in an area that has no pink stuff and you'll be fine. for this quest; see step 5 for more details. Step 1: Hug the right wall, jump over the first beam. This is so broken. You just need to walk next to right "wall" not even need to jump... faceroll as @#$%. 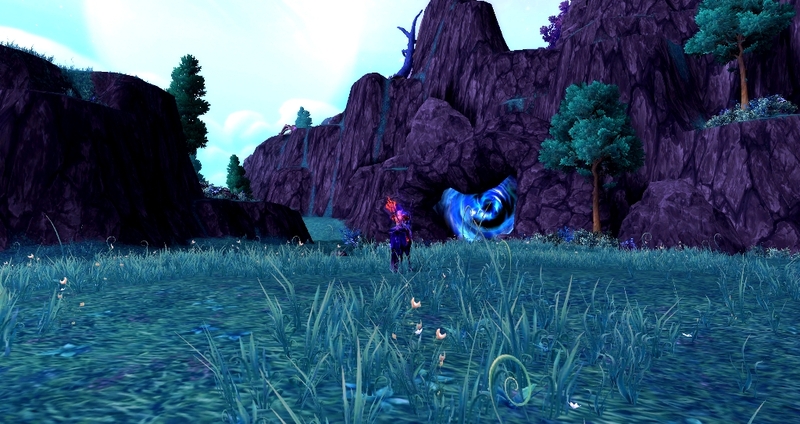 Here's a screenshot showing what the area outside the cave looks like (43, 74 in Shadowmoon Valley; ground-level). Click on the swirly to be able to go into the cave. Here's what it looks like inside (i.e., the maze); as you can see here, as priest I was able to levitate, but I suspect it only helped me get over the lines, I was still ported out when levitating over circles. I suspect the way this is supposed to work... Jump over the pink lines, and don't land on the pink circles... Or you can use some sort of blink/levitate/leap ability. 1. The cave is not in the 'raised part' of Socrethar's Rise, but if you're walking, it'll be down the stairs and to the left. It won't be named Socrethar's Rise when you get to it (the name eludes me at the moment, but it's not 'Socrethar's Rise'). See Cephadex's post for a screen shot which shows you exactly where it is. 2. As a few others have pointed out, no complicated jumping is necessary. Just hug the right wall and jump along it. You won't even touch the maze and thus won't get teleported out. Okay, we spent the whole questline gathering components for a bomb, but I missed the part where we blew something up. Thank you soo much! this is freaking perfect! so easy! i honestly felt stupid for not thinking of it! I submitted the screenshot as proof.. but all of you people talking about complicated jumping must have never bothered looking in your bags. When you accept the quest, you are given a Goblin Rocket to use to get over the runes. Simple as one click.. done and done. The end quest was bugged for me - was ported out even without hitting the last circles each time. So as a mage, just walked right up to the centre circle and Blinked to the other side - easy! If you've unlocked flying in Draenor you can fly right over the barrier before you're dismounted. Another super easy method is to just face the entrance of the cave and hit the side of the beams on the inside. It will launch you backward toward the grimoire. This quest finishes in a cave down at ground level in Shadowmoon valley. Look for a large swirling portal-type doorway, and click on it to plant the bomb and blast open the doorway. Next, the cave is guarded by a runic puzzle you must pass. It can not be disabled, and it can damage you. 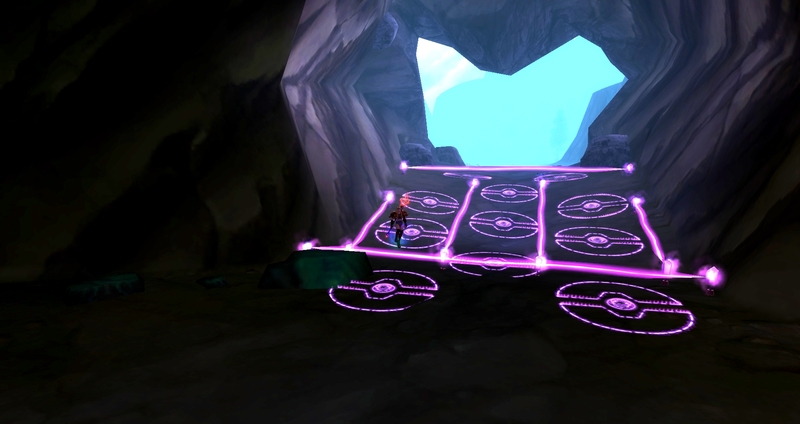 The runes teleport you out of the cave and up in the air. The ley lines throw you backwards. if you have flying, just fly in to the cave and you'll probably soar over the trap before you land. I've heard you can jump backwards through the ley lines, so if you hit one it might throw you into the cave instead of out. Not as easy as the other methods, I'd say. Turn-in back at your garrison, just outside your town hall. As a rogue, if there is someone already inside the cave and you hug the wall you might be able to shadowstep in. I got mine this way! Alternatively, bring a friend who can get in easily (warlock, flying mount etc) and then shadowstep! So as of today, Friday the 13th in October 2017, I can confirm that being a lock, you can NOT demon portal over the runes if you place your portal in the middle of the hall- it MIGHT work if you place if off to the side, but I wasn't waiting 2 minutes to find out. I did, however, do the moonwalk on the right. Jump over first barrier, face the outside of the cave and walk backwards. You have to jump backwards at the end and will hit a corner, but it tosses you into the cave instead of out. I don't yet have flying in Draenor because bleeping allies are cleaning out out Fangrila and refusing to let people farm rep. Lok'tar. Destrua a antiga barreira debaixo do Elevado de Socrethar e obtenha o Grimório do Vazio Inominável. I can sense a bad voodoo comin from ya, mon. Dat be da book I'm feelin? Dis book be a bad ting, mon. I'm glad we got it before it came into da wrong hands. I'll get it ta Jones for ya.